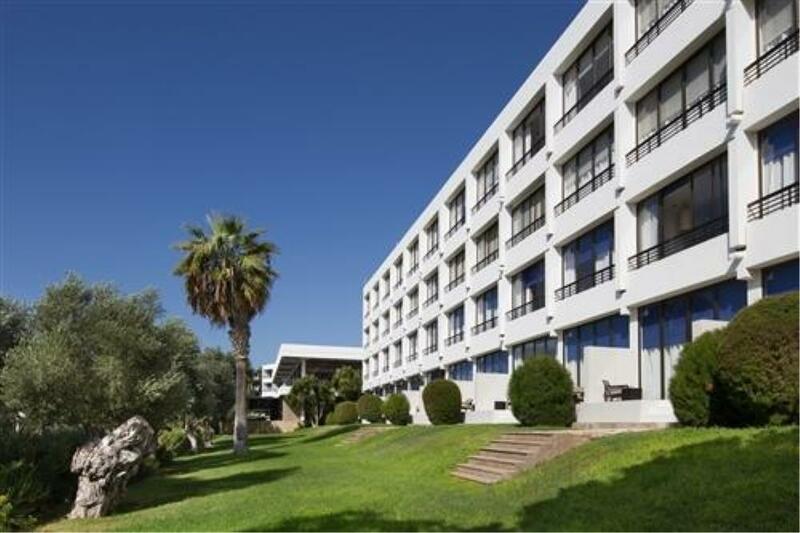 Set in eight acres of beautifully landscaped gardens with views of Pafos’ medieval castle and the Mediterranean Sea, Almyra exudes contemporary style and comfort, attending to every need of the modern traveller. Relax next to the clear blue sea surrounding Paphos. Enjoy superb food and wine, the best of Cyprus and other cuisines from around the world. Take a break from the stresses of everyday life and discover a real friendly welcome and an atmosphere of calm. Hotel Almyra is a member of Design Hotels and Thanos Hotels. Mare Nostrum boutique, located near the entrance to the hotel courtyard offers a retail range of designer shoes, clothing, jewelry and leather goods as well as everything you need for your holidays. Available brands such as Prada Linea Rossa, Miu Miu, Etro, Gucci, Paul & Joe, Eres, Vilebrequin, Helen Kaminski, Acqua di Parma, Pasquale Bruni Jewelry, Watches Paul Smith and ballpoint pens. 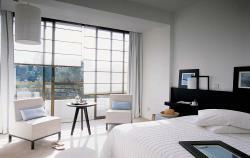 Types of rooms in a luxurious boutique hotel. A spacious double room in cool pastel shades with marble floors and bathrooms. While there is no outdoor balcony, sliding floor-to-ceiling windows overlook the Almyra’s landscaped gardens and the town of Paphos beyond. An extra bed or baby cot can be accommodated. Interconnecting rooms are available. Free Wi-Fi is available throughout the hotel. A stylish double room in cool pastel tones with marble floors. Floor-to-ceiling windows open out onto a private terrace that extends onto the lawn and Mediterranean gardens beyond. An extra bed or baby cot can be accommodated. Interconnecting rooms are available. Free Wi-Fi is available throughout the hotel. This stylish room with marble floors is located in the main building of the hotel. 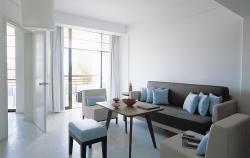 While there is no outdoor balcony, sliding floor-to-ceiling windows offer panoramic views of the sea and Paphos castle. An extra bed or baby cot can be accommodated. Interconnecting rooms are available. Free Wi-Fi is available throughout the hotel. This airy room has marble floors and panoramic views of the sea from a private balcony. An extra bed or baby cot can be accommodated; some of the rooms can be interconnected with a Junior Suite for additional space and convenience. Free Wi-Fi is available throughout the hotel. Contemporary convenience on the ground floor of the main building. 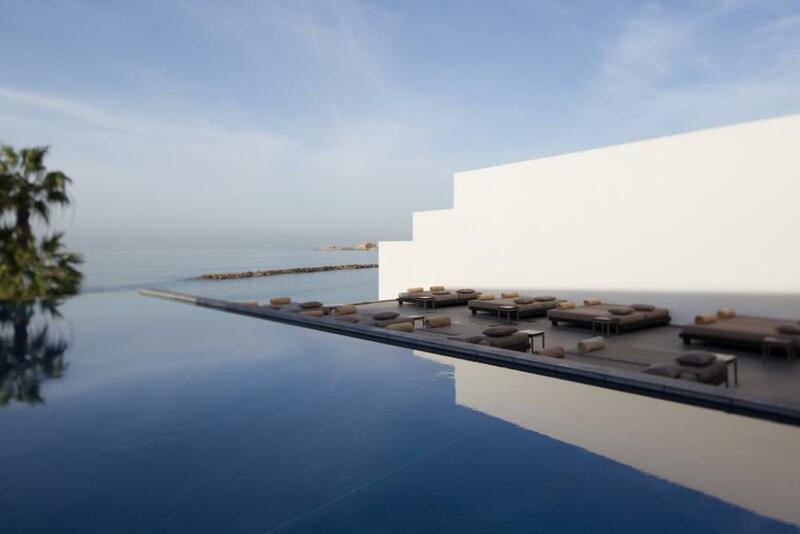 Dazzling white interiors, Joëlle Pléot-designed furniture and a spacious sea-view terrace that extends onto Almyra’s shady gardens and overlooks its stunning new 33m x 7m infinity pool. An extra bed or baby cot can be accommodated and interconnecting rooms are available. Free Wi-Fi is available throughout the hotel. Total Area: 28m² (plus a 14m² sun-bathing terrace with sun-loungers on a lower level). Named after one of the mythical horses that pulled Helios’s sun chariot, Aethon rooms are located on the first and second floors near the Almyraspa with balconies overlooking Paphos harbour and the hotel’s gardens. The rooms are furnished with custom-designed oak furniture, king size beds (twin beds available on request) and walk-in shower with sea-views. No interconnecting rooms are available. Please note that Aethon Rooms are for adults only (maximum occupancy 2 adults). Free Wi-Fi is available throughout the hotel. Ideal for young families, this spacious suite can accommodate a couple, an extra bed for a child up to the age of 12 and a cot. Sliding floor-to-ceiling windows in some suites open onto a balcony with panoramic sea views. 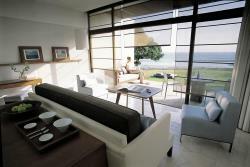 Some suites connect to a Veranda Sea View or Terrace Sea View Room. Free Wi-Fi is available throughout the hotel. Almyra’s signature suites occupy a privileged seafront position in the gardens, close enough to hear the gentle lapping of the waves (‘Kyma’ in Greek). This spacious open-plan suite has a sitting and bedroom area with spectacular sea views. 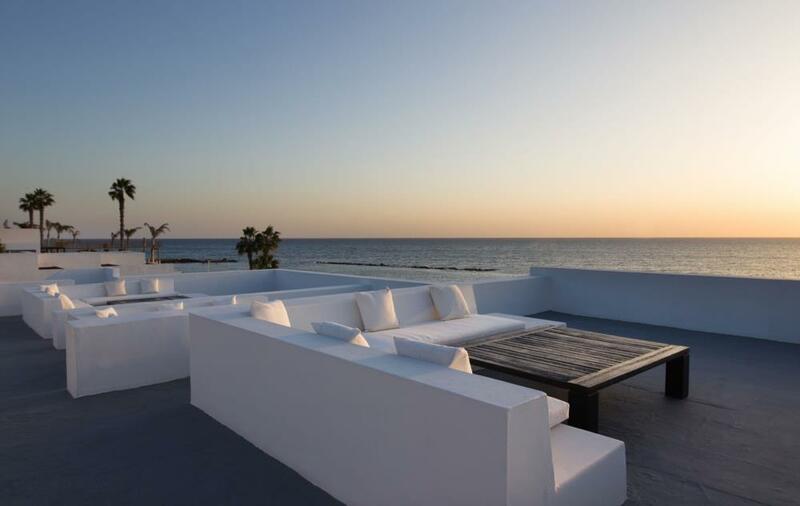 Outside, there is a seafront terrace, lawn with king size ‘day-bed’ and roof-top terrace with panoramic views of Paphos harbor. The suite can accommodate two adults, one child and an infant in a cot. 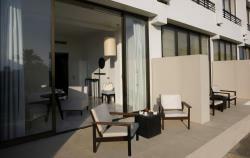 Roof top terrace: 44m² - Accessible from external stairs, located at the end of each block of Kyma Suites. This luxurious suite has a separate bedroom and living room with magnificent sea views. The living room has a further separate bathroom. Amenities include CD players, an espresso machine and exclusive bathroom toiletries. One extra bed and a baby cot can be accommodated. Free Wi-Fi is available throughout the hotel. This luxurious suite has a separate bedroom and living room with magnificent sea views. Amenities include CD player, an espresso machine and exclusive bathroom toiletries. One extra bed and a baby cot can be accommodated. Free Wi-Fi is available throughout the hotel. This magnificent suite has wide-reaching ocean views, two bedrooms and a living room with further separate bathroom. Additional amenities include an espresso machine and exclusive bathroom toiletries. One extra bed or a baby cot can be accommodated in each of the two bedrooms. Free Wi-Fi is available throughout the hotel. A spacious set of double rooms in cool pastel shades. 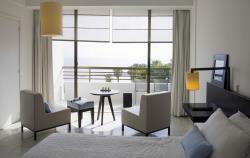 Floor-to-ceiling windows overlook Almyra's landscaped gardens and the town of Paphos beyond. An extra bed or baby cot can be accommodated. Ideal for families, this room combination can accommodate up to two adults and three children or infants. Free Wi-Fi is available throughout the hotel. Located on the ground floor of the main building, these rooms have marble floors. Floor-to-ceiling windows open out onto a private terrace that extends onto the lawn and Mediterranean garden beyond. Ideal for families, this room combination can accommodate up to 2 adults and 3 children or infants. Free Wi-Fi is available in all rooms. A spacious set of double rooms, these stylish rooms are located in the main building of the hotel, with marble floors and panoramic views of the sea and Paphos castle through sliding floor-to-ceiling windows. Ideal for families, this room combination can accommodate up to two adults and three children or infants. Free Wi-Fi is available throughout the hotel. Located on the ground floor of the main building, these rooms have marble floors and a sea-view terrace that extends onto Almyra’s shady gardens and overlooks its stunning new 33m x 7m infinity pool. Free Wi-Fi is available in all rooms. Total Area: 56m² (plus an 8m² terrace with armchairs, and a 14m² sun-bathing terrace with sun-loungers on a lower level). The Junior Suite has sliding floor-to-ceiling windows that open onto a balcony with panoramic sea views and the connecting Veranda Sea View is an airy room with marble floors and panoramic views of the sea. Ideal for families, this room combination can accommodate up to 2 adults and 3 children or infants. Free WiFi is available in all suites and rooms. Almyra’s signature suites occupy a privileged seafront position in the gardens; close enough to hear the gentle lapping of the waves (‘Kyma’ in Greek). This spacious open-plan suite has a sitting and bedroom area with spectacular sea views. Outside, there is a seafront terrace, lawn with king size ‘day-bed’ and roof-top terrace with panoramic views of Paphos harbour. All Kyma Suites are equipped with Espresso Machines. The suite can accommodate two adults, one child and an infant in a cot. Some interconnecting suites are available. Free Wi-Fi is available throughout the hotel. Almyra offers you a choice of four restaurants, each of them own way is different but they all share a taste of modern resort. Vegetarian dishes are available in all restaurants. Almyra has presented interesting and complex concepts in Notios, outdoors a la carte restaurant, which relies on the purity of Japanese cuisine and reflects the taste of the Mediterranean sensuality. Guests can enjoy a lavish buffet of dishes in a restaurant Mosaics, which also serves a delicious breakfast. Mosaics is the main hotel restaurant. Cuisine is diverse and represents the Mediterranean and international character. A la carte menu offers a choice of salads, cold appetizers, fresh cuts of meat and seafood. Exciting themed rooms such as the Asia-Pacific or Cyprus Traditional will be available. Located on the beachfront. Ouzeri offers Cypriot seaside dining: light Greek snacks, local specialities, the cool sea breeze and live entertainment several nights a week. Open April to November. Sit back and relax in the pool with unobstructed sea views in Eauzone Restaurant AlmyraSpa. Here, guests can enjoy easy and fashionable Mediterranean cuisine with an Asian flavor or enjoy one of their therapeutic teas. Please note that Eauzone is only for adults over 16 years. Opening 12:30 - 15:30 daily. Located on the right side of the lobby by the fireplace in a beautiful place for a pleasant lunch with magnificent views of the sea, accompanied by live music on some evenings. Fresh ground coffee, delicious pastries, cakes and snacks throughout the day, as well as cocktails and drinks. the perfect place to have a good time, with magnificent views overlooking the sea and the castle of Paphos. Meaning ‘trust the chef’ in Japanese, ‘Omakase’ surprise tasting menus involve guests ‘discovering’ each Japanese-Mediterranean course as they dine. The innovative concept features five to nine courses of Japanese-Mediterranean cuisine, each with a unique texture and flavour... Choose from Kiku ‘Chrysanthemum’ Omakase (five course menu), Yanagi ‘Willow Tree’ Omakase (seven course menu) or Sakura ‘Cherry Blossom’ Omakase (nine course menu). Omakase menus are available in Notios or as private dining on the candle-lit Kyma Suite roof terraces. Menus can be discussed with the Chef the day before and tailored to suit any occasion or requirement (including vegetarian), for groups of two to eight people. Bookings required minimum 24 hours in advance. Zen Meze © influences the atmosphere of Notios, where the waves orushivayutsya each other, where the sun meets the horizon. Offering food meze style makes it more enjoyable for families or large groups. It becomes more than just food - it becomes a social event. Zen uses meze dishes from the menu a la carte dishes are in the middle of the table and are accessible to everyone. Brand "Zen meze" is copyrighted Almyra. Especially for families, the weekly barbecue offers a delicious selection of grilled meat, fish and vegetables, as well as a variety of appetizers, salads and desserts on the Almyra seafront. Enjoy the sunset and the sea and the atmosphere, while the guitarist plays Greek music and accompanies the meal. Please book in advance. From long, lazy mornings to late, languid nights... anything goes when you’re on holiday. And our 24 hour in-room service caters for all those moments when only dining in will do: from simple salads and smoked salmon sandwiches to exotic Japanese bento boxes and Greek-style burgers, washed down with a glass of fine Cypriot wine. Call us day or night and turn your room, balcony or private terrace into your own private dining venue. Legend states that Aphrodite was born from the foaming waves that surround the Paphos coastline. Parasailing and water-skiing are available nearby. All water sports are provided by an external company and are available from April to November (weather-permitting thereafter) . With one floodlit tennis court, table-tennis, gymnasium, and sea sports such as windsurfing, kite-surfing, sailing cruises, parascending and scuba-diving, there are several sports to choose from at Almyra. Besides rock climbing, mountain biking, pony-trekking and hiking Hill activities are available. Location Almyra has the advantage of direct access to a wide gardens and the sea, as well as within walking distance of shops, castle, house of Dionysos with its unparalleled Roman mosaics and many other attractions in and around Paphos. Paphos with its beauty and majestic scenery was included in the UNESCO list of World Heritage, among the treasures were discovered mosaics Taseya and Iona survived underground for 16 centuries, the Tomb of the Kings, the ancient theater of the Odeon and other attractions you can visit to stay in this beautiful city. 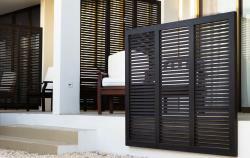 Almyraspa™ is a holistic utopia complemented by fantastic sea-views. It has recently been voted Spa Finder’s Readers and "Favourite Spa in Cyprus 2012” for the second year in a row. Six treatment rooms and three spa suites offer therapies using products from Osea, QMS and Ila. The Spa has an indoor pool, outdoor infinity pool, yoga deck, saunas, steam rooms, Vichy showers, gym, hair salon, tennis court and Eauzone restaurant. Almyraspa is a holistic adults only utopia where wellness, health and beauty merge into one. The aim is to deliver the highest quality treatments in luxury surroundings to promote health, beauty, well-being and vitality. ILA is a British ‘Beyond Organic’ Luxury Skincare Spa Brand. Treatments are based on yogic healing and marma therapy. They combine techniques to harness the products’ energy as well as that of the therapist and the guest, which results in experiences with a deep healing effect. Ingredients such as rose, orange blossom, olive oil, thyme, honey, rosemary and rose geraniumare synergistically combined in treatments and bathing rituals. This high performance skincare collection combines exceptional ingredients with revolutionary technology to create a unique portfolio of skincare products, facial and body treatments like no other. Kindly note that Almyraspa is only open to guests aged 16 and above. Between November and March, the indoor pool is open to children between 9am and 1pm, and is heated to 28°C. Located at the Pool level, Mosaics is easily accessible from the lobby of the hotel via the central staircase or the west staircase leading to the ground floor, pool and garden. There are two outside areas – a covered terrace with pergolas and a further terrace set amongst olive trees. 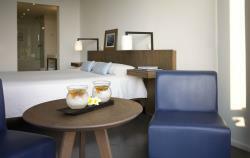 This room is bright and airy, reflecting the overall ambience of the hotel. With open views to the sea, pool and garden, this room is ideal for a more relaxed atmosphere. Mosaics also have a live kitchen, thus offering delegates the option of either a gala dinner or a buffet. There are both bathroom and cloakroom facilities available. Located at the Pool level with views to the pool and the sea, this room is easily accessible from the Mosaic Restaurant’s main entrance or the west staircase leading to the ground floor, pool and garden. There are both bathroom and cloakroom facilities. With convenient access to the Mosaics Restaurant next door, this meeting room offers both pre-dinner and banquet facilities, thus allowing for any culinary requirements to be taken care of, both before and after the meeting period. Located on the ground floor of the hotel, opposite the Mosaics function room. This venue is perfect for breakdown groups but also adapts itself easily into an individual meeting room. It enjoys full daylight and has easy access to the restaurants and pool area. Located at lobby level, this room is easily accessible from the Mosaic Restaurant’s main entrance and from the west staircase leading to the ground floor, pool and garden. There are both bathroom and cloakroom facilities nearby, and natural daylight and air-conditioning in the room. The whole room can be subdivided into 3 smaller meeting rooms. With convenient access to Aeras @ Helios and the Helios Bar, this meeting room offers both pre-dinner and banquet facilities, thus allowing for any culinary requirements to be taken care of, both before and after the meeting period. Overlooking Pafos Medieval Castle and harbour, this comfortable area opens out onto a private terrace, which is perfect for coffee breaks and sunset cocktail receptions. Located at the lobby level, this venue can either be used as a meeting room or a private dining room. Situated next to the courtyard of the hotel and bathed in natural sunlight, this is a private room that is ideal for special presentations, especially suited for syndicate purposes as it can be split into two rooms. 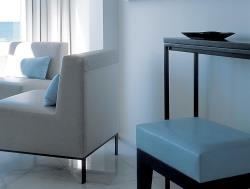 Athina is conveniently located near the hotel lobby and its facilities. *The Meal upgrade from BB to HB (where applicable) is valid only for Buffet Dinner at the Mosiacs Restaurant. (The free Half Board Special offer is not valid for lunch or at any other restaurant at the hotel). The Free Full board offer (where applicable) includes: breakfast, lunch and dinner (excluding drinks) and is valid at the Mosaics Buffet Restaurant (main restaurant) only. The relevant pre-order form should be completed and sent to the hotel prior to guest's arrival. The order form is available on request and all charges are payable at the hotel directly. A maximum of 3 children are allowed per babysitter. The Babysitters are experienced and not necessarily hotel employees. For cancellation less than 3 hours before the time of the booking, a 1 hour cancellation fee will apply.